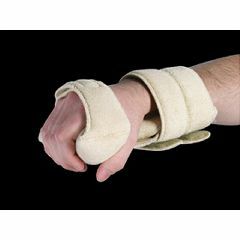 Ultimate Grip Splint has a basic structure of malleable aluminum that the therapist can bend to precisely fit the required wrist and forearm angle. The splint holds its shape perfectly, even with continued use. For incremental finger extension, the splint comes with two Ethafoam cylinders: 1 ½" and 1 ¾" diameter. A three-part softgoods set is included to accommodate use with a cylinder or, for severe contracture, without a cylinder. The terry/foam laminate cover provides additional padding and breathability--it wicks moisture away to maximize wearing comfort. hook and loop closures. One size.